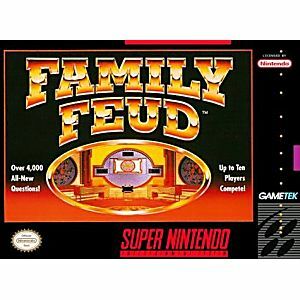 Family Feud SNES Super Nintendo Game Cartridge Cleaned Tested and Guaranteed to Work! 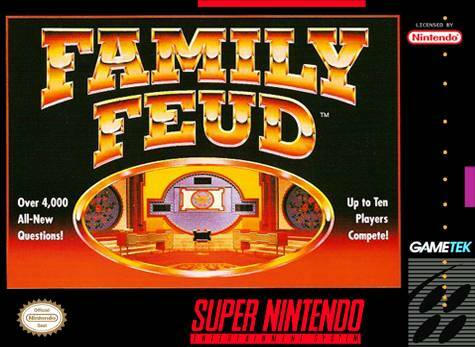 Based off of the popular TV show, two family of 5 contestants each compete each other to win prizes and cash! Play alone or with up to nine friends. 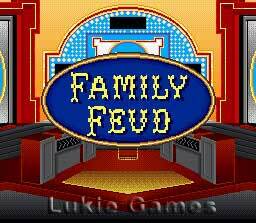 Full motion video families battle against each other in the fully rendered Family Feud studio. After the host's digitized voice reads the answer, ring in to guess the top survey responses from people across the country. Keeps you guessing and has a good game format...great for playing against human players. This game rocks!! 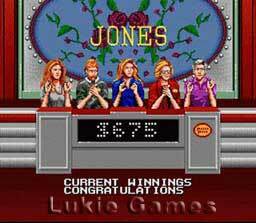 I love it even more because it's the old school question and I totally beat my kids every time we play :-) Love Lukie and their amazing customer service!! !